I thought I must write to you because you are in the news again – this time, saying that you saw nothing wrong in what Basil had done during the elections when he allegedly bought some pipes with his ministry’s money and distributed them for election work. SB, I do admire your ability to change your beliefs from time to time to suit your needs. You have gone from blue to green and then blue again and now you seem to be changing sides from Maithri to Mahinda maama once again. And all that time, you have somehow managed to be in the news! Why, we can even remember the days when you were Satellite’s blue eyed boy. You formed a good team together when she came to power in the early nineties. She promoted you over and above party seniors as the secretary of the Blue party when that old faithful servant, Dharmasiri passed away. The rest, as they say, is history. Your partnership with Satellite didn’t last long, possibly because both of you spoke first and then thought about what you said later. A year after you became the secretary of the Blues, you decamped to the Greens. Now, it seems like all secretaries of the Blues do this! With you in the Green camp, they were a different and formidable outfit. They created a post for you calling you a ‘national organiser’, whatever that meant. It didn’t take long, in fact only a few months, for you to mastermind a Greens victory over your old party – and the Greens were in power again. Satellite though still bore a grudge against you. So, even though the Green Man wanted to appoint you as a minister, Satellite refused to swear you in. When you were ultimately sworn in by her after a long delay, that picture told a thousand words – with both of you staring daggers at each other. As a Green Minister you overstepped your mark and said you won’t respect the ‘dog’s verdicts’ of a certain court. You were charged with contempt of court and the chap in charge of that court sent you to prison. But, looking back at what this chap has said and done since then, you may have been right! While you were languishing in a prison cell, many things changed in Paradise. Satellite had to leave the stage a year earlier than she would have liked to – again, thanks to the same man who sent you to jail and Mahinda maama had rather unexpectedly become the boss, beating the Green Man. Mahinda maama probably saw your value in the years ahead because he used the powers that he had to pardon you and get you released from jail. And you did return the favour by dumping the Greens and joining him a few years later, helping him to win the next round of elections, for a second term. 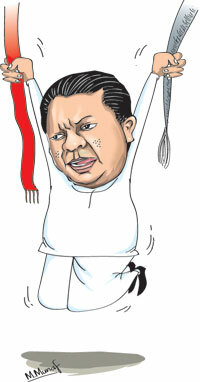 When Mahinda maama decided to run for a third time, you were very much with him supporting him all the way against the surprise choice for the ‘common’ candidate, Maithri. We thought that made sense because Satellite was with him – and after all, your enemy’s friend is your enemy as well. That was the time you showed us that you had lost nothing of your gift of the gab, despite being sent to prison for it. Why, it was you who said that when Mahinda maama won, Satellite should be stripped naked and made to run along the streets like someone who was mentally unsound! In fact, that may have alienated quite a few voters away from Mahinda maama who lost the election anyway. This is where your genius comes into play. Knowing which way the tide was turning, you quickly switched sides yet again and joined Maithri’s camp which now held the reins of power. You chose wisely. By the time the Blues lost the general election and you lost your seat, you had made yourself so indispensable to Maithri that he went back on his promise of ‘yahapaalanaya’ and reappointed defeated Blue candidates through the National List – and you were among the chosen few. In recent months, you have been singing Maithri’s praises and blaming Mahinda maama and Basil for all that is wrong in Paradise. That is why we are puzzled by your sudden defence of Basil and wondering whether you are ‘jumping’ again. Anyway, SB, with friends like you, who needs enemies? PS: SB, I know you don’t like to talk about the Olympics and Olympic medals, but this being Olympic season, I must ask you, can you get political high jumps included at the Olympic Games? Then there will be a good fight for Gold, Silver and Bronze between you, Thonda and Rauff – and Sri Lanka will always have a medal at the Olympic Games! Let us start investing in Tree Banks again!